Helps maintain normal healthy hair from within. Redkens exclusive Interlock Protein Network provides strength while the Shine Strong complex delivers a nourishing blend of coriander, camelina and apricot oil. Alterna have launched a fantastic addition to their Caviar range by introducing the stunning ‘Glossing Balm & Glossing Shimmer Spray’. The new products have arrived at Cienté. The Balm comes in a fantastic compact, complete with mirror, for any hair emergencies whilst out and about. The spray is small enough to pop in to a handbag for last minute glittery additions. Ask your stylist to demonstrate who the product works and the effect it will give for party hair. If you are looking for a range of perfect copper colors that are more vibrant and last longer for the autumn session, new from Redken and available in a range of wearable, modern coppers to high-fashion fiery coppers, COLOR FUSION RUBILANE® creates stunning copper results that is high intensity, even after 20 shampoos! Your Cienté stylist can use the shades alone or with each other to create unbelievable copper results. NEW GOLD, / Copper shades: Are a rich jewel like golden tones with hints of copper. Tones are not muted; they are true warm gold’s. NEW COPPER / Brown shades: True coppers that are rich, yet very wearable. Or, NEW COPPER / Copper shades: Richly dramatic tones of intense copper that mix with the hairs natural undertone to produce deep dramatic results with red copper tones at darker levels and bright copper at lighter levels. Colorbond Technology includes High Tenacity Dyes that lock together inside the hair, Ceramide that repairs the surface and seals the hair to protect the beauty of the color, Cationic Conditioners that nourish and smooth the hair and Coconut Oil that helps form a protective barrier against water. Just arrived at the Ciente salon is the new and latest must have from Alterna, “Overnight Hair Rescue” Those of you who already use the Alterna products will know what a fantastic range it has to offer. The new product is in the Caviar collection and is a leave on overnight treatment, which is a deeply penetrating treatment for dry, damaged hair and colour treated hair that repairs as you sleep. It has many benefits including; It absorbs instantly so it will not leave a residue on your pillows or sheets. It repairs as you sleep and the more often you use it the more your hair will benefit. As a result you will find that your hair will become more manageable, it will help to restore, strengthen and reinforce your hair and prevent future breakage. It works by using natural hair proteins and amino acids which penetrate and repairs from within, lipids to restore shine and elasticity at the same time as using a multi vitamin complex. All this will help to restore the damaged shaft and seal the cuticle for lasting results. It compliments the other products in the Caviar range and if you have colour treated hair or highlighted hair check out the range on offer at the salon. The Ciente team are always happy to explain all our fantastic ranges. The O is a unique tool which is simplicity it’s self, it’s pod will heat from cold to 130 degrees in less than 4 seconds and will help you to create gorgeous looks, full body and volume with movement. It has several size rollers all which fit into the pod one at a time to heat gently, but the amazing thing is the rollers are heated from the core so are hot in the hair but not in the hand, and they are soft grip so no pins are needed!! Ciente stylist are using this fantastic new must have in salon now so pop in for a consultation, the team will be happy to talk you through the O. Come in and see the fabulous new range and ask the team for product advice. Long gone are the days of poker straight hair, delivered with searing heat. Today, professional stylists and their clients want more. They want an iron that offers them flexibility. A styler that doesn't damage the hair. That's why we created Cloud Nine. Ciente are proud to present "Collexia Professional" this is the hairdryer that is a revolution in technology innovation and beauty. It is a cosmetic hair programme which has been designed with Italian excellence with ultra fast double power technology. 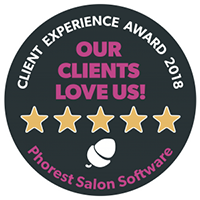 Exclusive in Berkhamsted to Ciente the hairdryer is designed to maintain the in salon treatments by continuing to treat the hair as you dry it at home. It has treatments that are attached to the nozzle and come in different strengths. Please ask in salon for more details. Alterna Professional Haircare creates groundbreaking furmulas the set the industry standard for the finest luxury haircare products in the world.